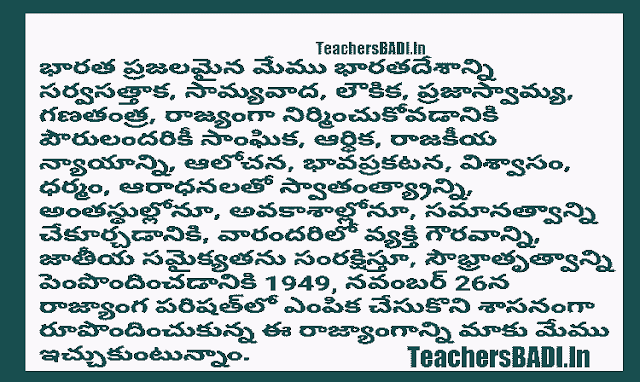 Constitution Day Preamble in Telugu , Constitution Day Celebrations Quiz Competitions on 26th November 2017 in AP, TS Schools/ GoI 1st/First Constitution Day Celebrations on 26th November 2017 in all AP & TS Schools: Director of School Education has given instructions for Celebrate the first Constitution Day on 26th November, 2017 in all Telangana Schools and all DEOs in T State will issue certain instructions on this subject to all HMs of all TS Schools of all managements. Subject: Celebration of 'Constitution Day' - reading aloud the Preamble in all Schools - reg. In continuation of this Department's letter of even number dated 23.11.2017 on the subject above (copy enclosed), I am directed to forward copies of the Preamble of the Constitution of India translated in 16 different Languages for the purpose mentioned in the subject, as received from the Ministry of Law and Justice vide their letter No.13 (i)/Misc./2016-Leg.ll/106 dated 24.11.2017. Subject: Celebration of 'Constitution Day' on 26th November, 2017 - reg. Reference is invited to Secretary, SJ&E's 0.0. letter dated 27.10.2017 on the subject mentioned above (copy enclosed). The Government has notified 26th November as 'Constitution Day'. It was celebrated for the first time in 2015. as part of the 125th anniversary events of Or. B.R. Ambedkar. 2. You would appreciate that this day holds immense significance in our nation's history and it set the path for evolution of our nation as a vibrant democracy. In view of this, it is advised that the Preamble to the Constitution (as it exists today) be read aloud in all Schools. This will sensitise our children towards the basic features enshrined in our Constitution. 3. Since 26.11.2017 is a holiday (Sunday), the 'Preamble' may be read on any day from 27.11.2017 to 30.11.2017. A copy of the Preamble in English and Hindi, as received from the Ministry of Social Justice and Empowerment is enclosed for kind reference. Sir/Madam, Reference is invited to Secretary, SJ&E's 0.0. letter dated 27.10.2017 on the subject mentioned above (copy enclosed). The Government has notified 26th November as 'Constitution Day'. It was celebrated for the first time in 2015, as part of the 125th anniversary events of Dr. B.R. Ambedkar. The Preamble is like an introduction or preface of a book. 1. All Education Secretaries of the State/UT Govts. Subject: Celebration of Constitution Day - 26th November, 2017 - Quiz Competition reg. ii) There will be a link available on Ministry of Human Resource Development's web-site (mhrd.gov.in). namely. 'Constitution Day Quiz Competition'. which will he operational from 9.00 AM on 25th November 2017. The link will be active for 02 days, i.e.. 25,1November 2017 and 26th November 2017 upto 5.00 P.M.
iii) Schools affiliated with CBSE will login using their existing credentials (user ID and Password) as already by CBSE, Non CBSE schools Will be given facility to register themselves for creating credentials (user ID and Password) after which they will also be able to login her login. schools will be able to download Quiz Documents and Answer Keys. v) Students will mark their answer option on the quiz document against each question. The school will evaluate the answers marked by the students against the downloaded answer key. (vi) The scoring will be done by the school according the answer key and 3 top scorers from each group, i.e., class VI-VIII and class IX-XII will he short listed. School will login on the portal and update/upload the top three scorer winners data from each group. It is requested that suitable instructions may immediately he issued to the Principals of all the schools falling under your respective jurisdiction to organize the Quiz Competition on the Constitution of India amongst the students of their schools by following the aforesaid procedure. 3. This issues with the approval of Secretary (HE and SE8.1.). As you may be aware, the Government of India has decided to celebrate 26th November, each year as 'Constitution Day'. I request you to encourage schools in your State/UT to celebrate this day in a befitting manner. 2. It is suggested that all schools may take up various activities to commemorate the day. These activities may include, among others, reading of the Preamble to the Constitution; reading of the fundamental duties as enshrined in Article 51 A of the Constitutions and activities such as debates, speeches, essays and quiz competitions on the Constitutions of India. 3. I would also like to point out that, this year, the 'Constitution Day' would fall on a Saturday. The celebrations and activities indicated above could be carried out in educational institutions on the 25111 November, in case 26th November, is observed as a holiday in your State. 4. It is, therefore, requested that you may sensitise all school children in your State to the significance of the occasion and actively conduct suitable activities on this day. A report on the same may be shared with us along with photographs and multi-media documentation of the observance. Subject: School Education - Celebration of first Constitution Day on 26.11.2015 - Reg. Reference: Govt. Memo.No.6196/SE.Genl./ A2/ 2017, Dated:04.10.2015. While enclosing the reference cited, all the District Educational Officers in the State & Regional Joint Director of School Education, Hyderabad & Warangal are requested to take necessary action in the matter. 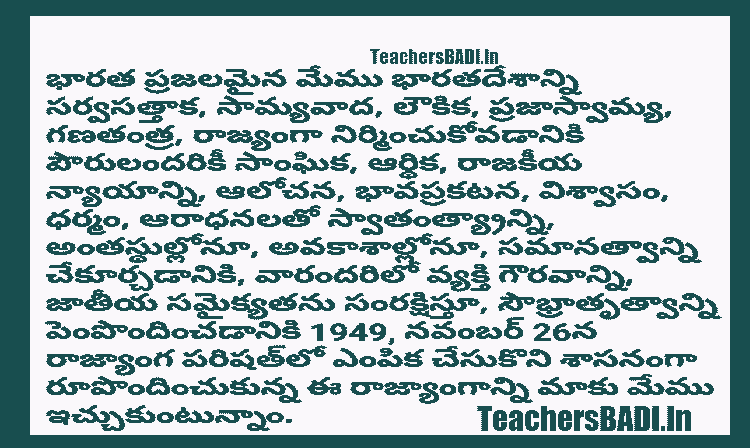 AP SCERT(State Council of Educational Research and Training) Director has given instructions for Celebrate the first Constitution Day on 26th November, 2015 in all AP Schools and all DEOs in AP will issue certain instructions on this subject to all HMs of all AP Schools of all managements. Proceedings Rc.No.686/B/TE/SCERT/2017;Dated: 6-11-2015, Subject: SCERT, A.P., Hyderabad - MHRD, 001, New Delhi - Celebrate the first Constitution Day on 26th November, 2015 in all Schools - Issue instructions to all Headmasters of all schools of all managements - Request - Reg. Reference: D.O. Lr. NO. 140154/2017-Sch-3, dated: 30th October, 2015 of the Joint Secretary (SE.I) Dept. of School Education & Literacy, MHRD, 501, New Delhi. All the District Educational Officers in the State are informed that, in the ref. read above the Joint Secretary (SE.I), Dept. of School Education & Literacy, MHRD, GOI, New Delhi has informed that, Govt. of India has decided that all the schools throughout the country may conduct the following activities to celebrate the first "Constitution Day on 26th November, 2017 wide participation of students and teachers. 1) Preamble to the Constitution las it exists on date) may be read out in the school assembly on 26th November, 2015 by all students. 2) One period may be devoted on 26th November, 2015 for a talk on the salient features of the Constitution of India and its making, by a guest speaker or one of the teachers. 3) Essay competitions and games may be organised on the theme of the Constitution. They are therefore requested to issue necessary instructions to all Headmasters of schools of all managements in their jurisdiction to conduct the above activities and celebrate the Constitution Day on 26th November, 2017 with wide participation of students and teacher and submit consolidated report by 10th December, 2015 in this regard.